This week is all about saluting the fun of comics. The mightiest of the mirthful, the brightest of the bold and the most hardcase of heroes. First up to the punch-line, that pliable prankster, Plastic Man. One of my personal fav's and a hero who has proven the need for non-biodegradable slapstick humour and quirkiness since 1941, Plas may have missed a spot on the current Justice League International due to unpredictability, but with a new cartoon as part of the all new DC Nation on Cartoon Network in 2012, I doubt it'll give him a meltdown. Next year won't be the first time folks get to enjoy the Plastic Man brand of zaniness as they munch through their Saturday morning bowl of cornflakes either. The Golden Age icon was a key part of the recent Batman: The Brave and The Bold hit show and back in the 80's, his solo cartoon adventures were even introduced by Plastic Man himself! 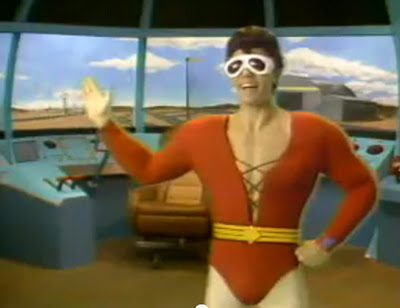 Sure, age tells you the live action Plastic Man was actually Mark Taylor, but to 'little Dan' back in the day, it truly seamed like the real Patrick Eel O'Brian was hosting The Plastic Man Comedy Adventure Show and other super-heroes like Robin could drop in at any minute! If you thought maintaining that voice was a stretch, you ain't heard nothing yet. Mark's greatest and most inspiring battle happened after the cameras turned off, and it's just one of 100 interviews with the cast and crew of 70's and 80's superhero entertainment, compiled and created by author, Marc Tyler Nobelman. A marathon feat in itself (and released one interview per day, over at website Noblemania), Marc's talk with Mark peels back the mould to reveal not only how the show was created, but how a man who was a successful stand-up, centrefold model and TV personality, recovered when health issues practically set him right back to square one. The married father of two speaks openly and honestly about the challenges beset him and his family, from hereditary complications related to malformed blood vessels in the brain, that after hemorrhaging, removed his ability to even speak, read or write. Ironically, years on, the events have left Mark's perspective on life transformed in ways the fame of the shape-shifting Plastic Man and his former life was never able to do. Still overcoming a few residual deficits of his health condition after brain surgery, Mark has let go of the entertainment industry to learn physical therapy, inspired by those who helped him get through one of the most difficult times of his life. "I’m now blessed to be able to help people who are afflicted like my mother and I were. Many people have told me that this is the work I was meant to do. With complete peace of mind, I agree. It’s not Hollywood, but it is Super-work." It's a powerful and motivational momment, in a monumental series of interviews. To start your week uplifted by it's tale in full - or that of any of the others in the series going behind everything, from Super Friends to Scooby-Doo, Where Are You?, simply click the jump. Thanks for the coverage, Dan, and I (obviously) couldn't agree more about Mark's courage and inspiration. Thanks for all your patience Mark, it really is a great resource you've put together there!